Almost all products, except for very limited ones, are named according to the following format. By knowing the law, you will be able to quickly find the target one from your inventory! Each package has ANHELO as its header. You can unpack when you rez or attach one. Each folder has -ANHELO as its header. After unpacking, new folder appears in your inventory. Each product has --ANHELO as its header. This is what you actually use. When you search your inventory with anhelo, you will find packages, folders, and products. When you search your inventory with -anhelo, you will find both folders and products. When you search your inventory with --anhelo, you will find only products. House — houses, huts, barns and so on. Misc. — It is the most abundant type of our products. Furniture — What we call FURNITURE are using SIT. This also includes vehicles that do not drive but have some poses. Ruins — Old structures such as ruins or broken houses. Gacha — As you know. Theme — A set of several structures made based on a specific theme. 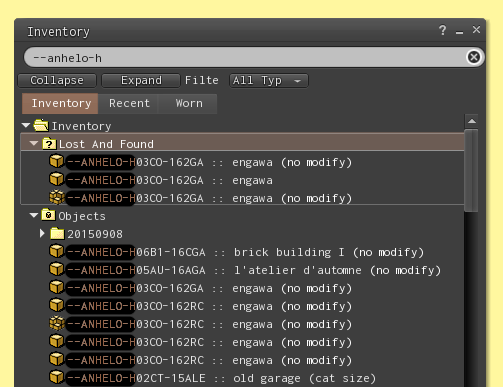 you should search your inventory with --anhelo-h! — No need to remember product name at all!! Version code represents the year, month, and state of product development. — Each month is represented by a hexadecimal number. This is mainly used for convenience when we develop. However, it may be helpful for you to know the timing of product development, and it is easy to compare old and new if upgrading the product in the future.